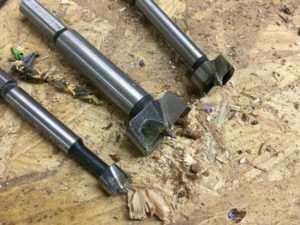 This is The Ultimate Guide to Using Forstner Bits. 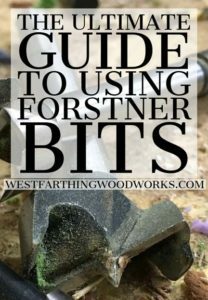 Have you heard of Forstner Bits but you don’t know exactly what they are used for? Do you need a little more information on why these bits are amazing? If that’s you, then this is your guide. 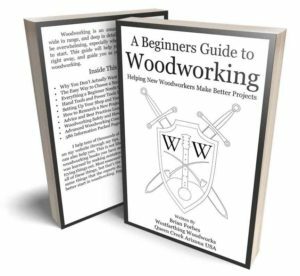 By the end, you will know everything you could ever need to know about this amazing woodworking tool. Enjoy. 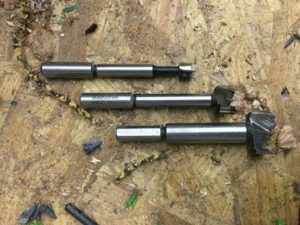 What is a Forstner Bit? A Forstner bit is a special kind of drill bit that has a number of specific uses. There are already several other types of drills on the market, many of which you are already familiar with. You probably have several in your shop already. The most common is the twist bit, followed by the brad point bit. These are the standard cylindrical drills that are found in nearly every hardware store. After that, you might have paddle or spade bits, and these are great for larger holes. The Forstner is also a large bore bit, but it does come in smaller sizes that are more convenient and common for basic woodworking needs. They are shaped like an upside down letter T, with the boring part on the bottom and the shaft on the top. The cutting action happens at the head, and there are areas that cut through wood and remove it from the bore. They fit standard drill chucks, and have a nice center point for getting the bit started. You can find Forstner bits in many hardware stores, and online too. What is a Forstner Bit Used For? The essential task of a Forstner bit is to drill holes in wood. This is the same task as other drill bits, but the Forstner does it in a better way. The holes are cleaner, the bores are smoother, and the bit just works so much better than twist bits. If you purchase a set of Forstner bits that range from 1/4 inch to 1 inch, you use that set like any other drill set of that size at the basic level. The bigger bits are nice to have too, because most drill sets only go up to half an inch. The real advantages of the Forstner bit are discussed in the next section, and there are several. 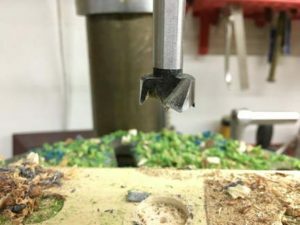 once you start using the Forstner bits for what they are capable of doing beyond your twist bits, that’s when you really see them start to shine. 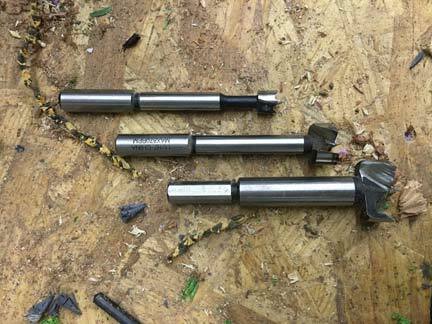 There are several advantages of using Forstner bits over other bit types. Here they are, and they can all give you more control and more options as a woodworker. Forstner bits leave clean, precise flat bottom holes. The difference between a twist bit and a Forstner bit is enormous when it comes to the smoothness of the bore. You can drill through a very thick piece of wood, and leave clean holes. There is less tear out with a Forstner bit. When you drill, the cutting action can pull fibers from the wood. This leaves rough areas, and that can mean more work. The Forstner bit is very gentle on the wood, and removes material where needed only. These bits start in the wood very well. With twist bits, you need to worry a lot about the drill walking away from your mark. Drills are lazy tools, and they go where they want to go. Thanks to the center spur, Forstner bits enter the wood really well, and right where you want them to. Bigger holes and bores are possible with Forstner bits. Twist drills are only sold in so many sizes. Forstner bits come in and overlap some of the sizes, and then head up to very large diameters which can be several inches. Forstner bits are inexpensive. While some of the larger bits can be a little more expensive, the standard sizes are not. You can get a good quality set of bits for about $20, and you can also get much larger sets for a little more. There is minimum blowout when the drill exits on the bottom of your material. This is great, and it saves you time and material cost. 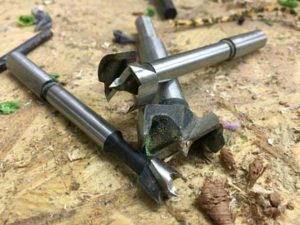 When normal drills break through catastrophically sometimes, Forstner bits do not. The design of the bit is self clearing. 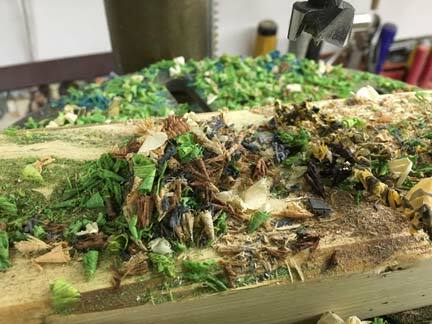 As you drill, you will notice a lovely pile of fresh wood shavings pouring out of the bore. This is the clearing action that keeps the bit working on fresh wood, and not grinding up wood dust. It’s beautiful to see, and it makes the bits more efficient. Forstner bits are also great for angled holes. Since the cutting edge does the tracking, you can use the drill to make large angled holes in wood. Use a drill press and clamps for stability, and so you can drill straight. Watch a video or two before you do it yourself, but you can easily make angled holes as needed with this type of drill bit. Make holes that overlap easily. Drilling with regular bits, it’s hard to get holes that overlap without the drill breaking out, or slipping through the overlap. Forstner bits stay right where you start them, so you can drill next to an existing hole easily. If you have to remove a lot of material quickly, such as inside a cavity, the Forstner bit is awesome at clearing out the waste. Since the drill overlaps so well, all you need to do is set a depth stop, and keep on drilling to remove the material. Before Forstner bits, the best option that you had was a hole saw. While a hole saw was a good tool at the time, and is still a good tool for some applications, it doe not perform as well as a Forstner bit. Hole saws are really meant for thinner stock, and for going completely through a piece of material. The easiest application to think of is when you need to make a hole through a cabinet to pass wiring for lights or plumbing. A Forstner has the advantage over a hole saw because it can drill to a certain depth and stop. You also don’t have to remove the disc from the saw, which can be very hot, and sometimes will not come out easily. The best Forstner drill bit sets are made from better high speed steel, or carbon steel and are made by a manufacturer that you have heard of before. There are inexpensive steel Forstner bit sets you can buy in bulk for a deal, but they will not last as long as bits from a dedicated tool manufacturer. Like most things, the more you spend, the more you get. However, there is a point where the quality difference does not match the difference in price. As a good rule, go for the middle price range, and you can find good bits that are not going to burn out right away. The quality of the steel, and the quality in which the bits are made translate into their ease of use and their longevity. Poorly made bits will not function very well, and poorly sharpened bits will not cut well. Avoid the bargain basement bits, and get something from the middle range. You will get a really good set for the money, and you will be glad you spent the few extra dollars. It’s actually not much of a challenge to get good Forstner bits. Since the bit style has become so common, you can actually find them in a number of places where tools are sold. This is great for new woodworkers, because they are not a high price boutique item. Start your search in your local hardware store if you want to get out and stretch your legs. Look for a brand that you ave heard of before, and start there. If you have no idea about brand quality, then do a little Google search and see how long the company has been making tools for woodworkers. That little search will reveal a lot. Once you have a good maker in mind, then you are ready to make a purchase. Before you do, see the next section about getting a deal by purchasing a set instead of single bits. Another good place to look is online. Amazon sells Forstner bits, and you can choose form many different makers. Look at the review, and pay attention to the price averages. You can find good deals on Amazon, and you can have the bits delivered very quickly. Like most things, buying in bulk will help you save money. While you don’t need to buy a 50 pack of half inch Forstner bits, you can do really well with a small set of bits. This way, you have a lot of sizes to choose from when you need it. Most single bits are anywhere from $6 to $10, and most sets start around $20 to $30. This means if you plan on buying at least three bits, you might as well just buy a set that contains those three as well as several more in other sizes. Since you are going to spend the same amount of money, you are getting more value in a set. I’ve personally had instances where I needed to replace two bits from a small set, and the cost of the two bits was more than the set, so I just bought another set. I didn’t really need all the other sizes, but the next time one of those needs to be replaced, I will already have it. The beauty of a Forstner bit is that you can find them in nearly any size. They don’t get much smaller than 1/4 inch, because the geometry of the bit prevents making them smaller, but they go up to very large sizes that are several inches in diameter. The real advantage of this style of drill bit is the bigger sizes. The majority of bits you see on store shelves will be in the 3/4 inch plus range. This is because most people already have drills smaller than that in their drill index. The reason people grab Forstner bits is because they need a larger bit, and they don’t have it. The new bit is a perfect choice, because it’s the larger size that you need, but it’s also inexpensive, which is a double win. There are a lot of times where you need to use a larger bit, and using a Forstner bit makes perfect sense. These do not come up all the time, nor in every single project you make, but when they do come up you will appreciate having them. Also, you can use your Forstner drill bits in power drill, or drill press. Both work really well, but since it’s a power tool accessory, it’s not really meant for hand tools. It can work, but it’s a lot of cranking to manually drill with a Forstner bit. One important time is when you have to dig out an entire cavity inside a piece of wood. If you need to excavate a few inch by a few inch cavity that is maybe an inch deep, a Forstner bit will power through the material very quickly. After that, you can refine the shape with the router, and save your valuable router bits from all that wear and tear. Depending on if you are covering the cavity, you may not even need to refine it with the router at all. Of you make clocks, the battery end of the movement can be bulky. Get a a Forstner bit, you can easily make a counterbore hole that the movement fits inside nicely. You can also set the depth, which means you get to decide how far out the hands of your clock will reside over the face of the clock. An alternative to the Forstner bit is the spade or paddle bit. While the surface they do the same thing, the way they accomplish it is very different. If we were speaking in surgical terms, the Forstner is a scalpel and the spade bit is a chainsaw. While you could remove an appendix with a chainsaw, the damage it would cause would not be worth the demonstration. A spade bit is a rough way of removing material, and the insides of the holes will require a lot of refining afterwards. In contrast, a Forstner will drill the same hole, without the aggression, and without the damage that the spade bit causes. Your hole will be clean, there will be less tear out, less blow out, and less to do to make the cavity look nice when you are done. If you have used both, there is no comparison to the quality and the precision of the Forstner bit. The paddle or spade bit does not even come close. A nice thing about Forstner bits is that you can sharpen them without a lot of fuss. Twist drills are a bit more involved to sharpen, and you really need a nice jig to do it well as a beginner. The Forstner bits are a lot easier, and all you really need is a sharpening stone or card. There are two cutters on Forstner bits. And you can hit them with a diamond hone to bring their edges back to life. Make sure to work slowly and carefully, and count your strokes on both sides. It’s important to sharpen them evenly. It’s also easy if you just take your time. If you are thinking about sharpening your own bits, then I recommend looking on YouTube for some videos, and watching several before you begin. This way, you have a good idea of what it takes to sharpen your bits, and you are familiar with the process. 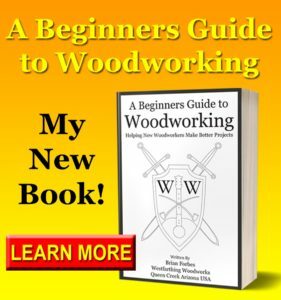 Let Me Teach You Woodworking! Now that you know everything you need to know about Forstner bits, it’s time to buy a set and give them a try. I recommend buying a small set of maybe 8 bits, which will be about $20-$30 depending on what you buy. The nice thing about a set of wood boring bits like this is you get a wider range of sizes, and more opportunity to use them. If you only have a one inch bit, you may not need it very often. In contrast, you will find a hundred reasons to use your whole set. Once you do start using them, you will be hooked. These are some of the easiest bits to use, and some of the most fun. The whole process of making openings, drilling holes, and creating cavities is far more enjoyable. If you have any questions about The Ultimate Guide to Using Forstner Bits, please leave a comment and I will be glad to answer them. This is the one wood drill you won’t be able to live without after you own a set. Happy building.